I love teaching history to my students. Our fifth grade curriculum takes us from Westward Expansion all the way through September 11th. It's so interesting to see our world change throughout the years, and students are amazed to see the impact of things like the automobile and the radio on American culture. Technology is one those innovations that changed the course of history forever. This year, I have really made it a goal to create Google Classroom assignments that align with our curriculum. In my social studies class, for example, I have students with a wide range of abilities - from resource to gifted. What's interesting to see is that they ALL thrive when working through a digital assignment! When we went to school, our professors always talked to us about the importance of self-discovery. When we allow students to be curious, their thirst for further knowledge will teach them more than they can learn in a classroom! 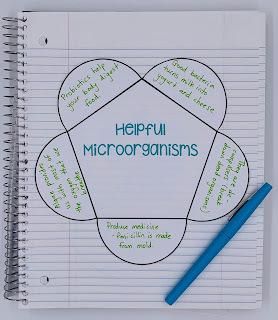 I tried this theory earlier this year as I began a unit on Helpful and Harmful Microorganisms. Before teaching my students about Helpful or Harmful Microorganisms, I quickly found some grade-level appropriate research about 6 different microorganism and attached it to their Google Classroom. 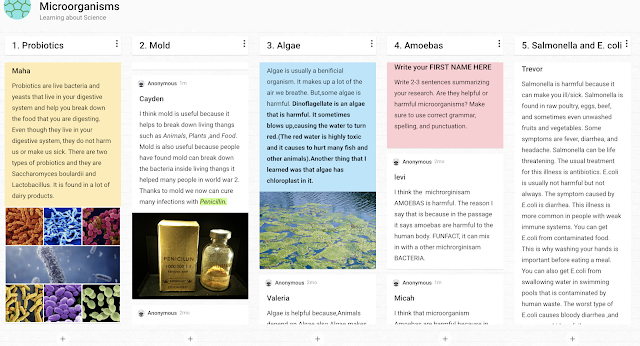 I then assigned students a different microorganism to read about and asked them to summarize their findings in a few sentences on a Padlet. I was SHOCKED to see their responses! If you've never used Padlet, you definitely want to try it out. It is like a digital pin-board. They have really improved the site since it first began. It is very user friendly! Now, I asked students to summarize their research in 2-3 sentences, but many students clearly went further than that. They added pictures along with their summary, and I even had a few students include short videos. This was all on their own - I had not used Padlet with these students before. Pure self-discovery at its best! The next day when I started to teach them through my own lessons, the kids kept raising their hands to tell me facts about the different microorganisms. When I talked about harmful bacteria that causes Salmonella, for example, the student above raised his hand and told us all of the harmful effects of Salmonella! Sometimes teachers are afraid to use technology in their classroom because they don't understand it. The idea that I mentioned in this post is easy to implement and will inspire curiosity! Check out these other great ideas for inspiring wonder and curiosity with your upper elementary students!